Bielle probably takes its name from the Roman occupation brought about by Caesar in 51AD and his Lieutenant Publius Crassius. In fact a Magister (a sort of Roman ‘prefet’ = a regional town council leader) built the « vila » as the administrative seat answerable to the diumir of Oloron (a sort of super prefet) , who gave his name to the town promoted to the position of « Capduhl » (main town) of the valley. The Roman influence was not limited to the establishment of an administration but also brought about an economic revolution through the introduction of the growing of cereals (millet, rye, barley) which led to the development of the plain of Bielle whilst the high areas remained pastoral, grazed by cattle. The decadence of the Roman empire left the way open for invaders of which the Goths were the first. Under the command of Euric, leader of the western Goths (Visigoths) they surged into Gaule from Spain, from the Pyrenees right up to the Loire. But Euric’s realm collapsed under the reign of his son Alaric who was defeated in 507 by Clovis at Vouillé. From the 6th century to the 9th century there were successive invasions until the Norman one of 840 to 877. The later ones came via the Gave d’Ossau ( ie a river) and the inhabitants of the lower valley (Arudy) surged into Bielle to take any vestige of the Roman remains. Under the command of the young Lord of Béon they resisted the assaillants who decided to use trickery to capture the young wife of the Lord of Béon, the beautiful Margalicte, offering her freedom in return for control of the area. This proposition was rejected by the Lord of Béon , who challenged the leader in single combat to determine the fate of his wife and that of the valley. The young Lord, slender and quick, knelt before starting to fight and made a promise to erect a chapel in the Virgin’s honour if he won. After an interminable struggle, with a blow from his axe, the Lord of Béon decapitated tha Norman giant and the soldiers fled. 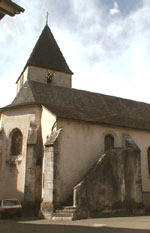 On that very spot they built the Chapel of Notre Dame de l’Ayguelade, at the northern entrance to Bielle. 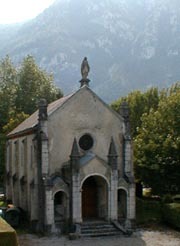 Until the end of the last century a pilgrimage to this chapel took place once a year, the procession was led by the first magistrate. From Charlemagne to Louis XIV there was a rather unusual type of feudal regime. which led to an increase in the number of Lords. Up to the 12th century the Ossalois lived relatively free and independant lives under the Centulle viscounts with whom they had established a charter of freedoms called « for » and they did not want to give this up. This is why the new squires were unable to exercise an important role in the face of the well organised solidarity of the Ossau people. The nomination of the ‘jurat’ (ie an area council made up of representatives from each district/parish) was the most important event in the life of the Ossalois community. In addition to attending the meetings of the Jurade the members of the jurat carried out the functions of the police and the judge, they also administered the wealth of the community. From 1355 these meetings took place in the ‘Segrary’, a small vaulted room situated in the sacristy of St Vivian’s Church in Bielle, this room was reached by way of a stone staircase. They would arrive before midday, take part in the mass, then install themselves in the segrary in their allotted places according to a diagram on the wall. The representatives from Laruns presided over the session which began with a prayer led by those from Bielle. Once the session was underway the deliberations were passed by a majority vote. Whoever wished to speak had to be standing and to have his head uncovered, if anyone interrupted a colleague he had to give a bottle of wine by way of forfeit. The jurade was invested with a moral authority in which all Ossalois had unshakeable confidence, it assured the material well being of the inhabitants and the maintenance of priviledges in the face of the authority of the Lord.